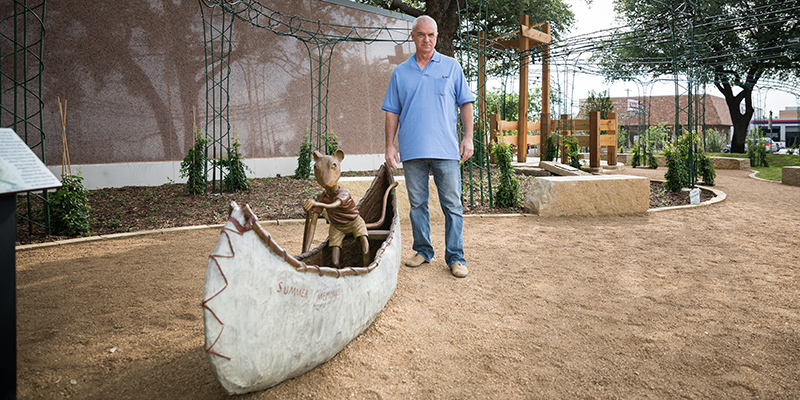 Art professor Geoff Broderick poses next to “Stuart in a Canoe,” one of the sculptures he cast for Abilene’s new Storybook Garden. Frozen in bronze on the walkways of downtown Abilene, the Sandman and the Tooth Fairy remind people of childhood stories. These characters from William Joyce’s Guardians of Childhood were the first sculptures Geoff Broderick, associate professor of art, helped to cast in bronze. The Texas legislature named Abilene the Storybook Capitol of Texas in 2015 because of these pieces and their connection to the annual Children’s Art and Literacy Festival (CALF). For Broderick, casting the sculptures is a way to connect to the community while showing students in ACU’s Department of Art and Design the business of art. Broderick earned his Master of Fine Arts degree in sculpture at Southern Illinois University. After he graduated, he worked at the Shidoni Foundry in Santa Fe, New Mexico, casting bronze sculptures for 14 years. He was hired at ACU in 1999 with the understanding that he would not only teach, but also do outside work for the community. “I have this triangle where I do teaching, outside work and my own work and they all feed each other,” Broderick said. Broderick started bringing storybook characters to life when he was commissioned by the National Center for Children’s Illustrated Literature (NCCIL). Steve Neves, professor of art at Hardin-Simmons University, sculpts the pieces while Broderick casts the pieces in bronze. Together, they created Sanderson Mansnoozie (the Sandman), Toothiana (the Tooth Fairy), David and Fergus, and more for the Storybook Sculpture project in downtown Abilene’s Everman Park. Broderick faced his biggest challenge in the “Duck on a Bike” statue created in 2015 because he had never before heard of anyone casting a bike in metal. He used a real bike to create a mold, then he cast each part of the bike and welded them together. “It’s hard work, but when you’re done it’s exhilarating,” Broderick said. 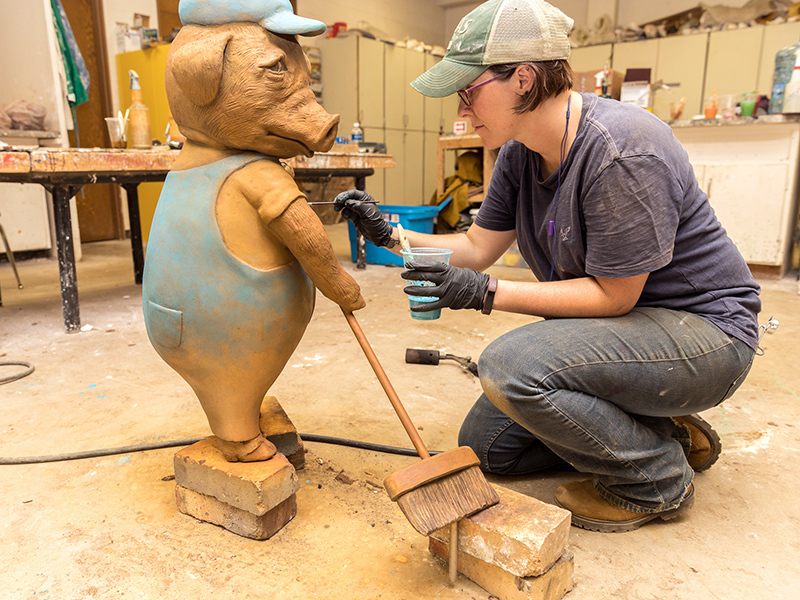 Becki Bishop, a 2004 ACU art graduate and head patineur at Deep in the Heart Art Foundry in Bastrop, Texas, adds color to one of the “Three Little Pigs” sculptures now on display in Abilene's Storybook Garden. Broderick has completed several sculptures for the Adamson-Spaulding Storybook Garden on the southeast lawn of the Abilene Civic Center. He started with characters from Garth Williams’ illustrations of Charlotte’s Web and Stuart Little, and created sculptures of “Stuart in a Canoe,” “Wilbur the Pig” and “Charlotte the Spider.” Although he could have cast the spider all at once, he meticulously cast each of its eight legs to prevent shrink lines on the metal. He also created a sculpture to illustrate the popular Little Golden Books’ The Three Little Pigs. Broderick said the sculptures have been a collaborative effort. He teamed with a former student, Rebecca (Barker ’04) Bishop, who painted the sculptures using special chemical processes. Bishop had done the same for Jacob’s Dream in her role as head patineur at Deep in the Heart Art Foundry in Bastrop, Texas. Another of Broderick’s former students, Kaitlyn Brown (’16), said Broderick is wise and intelligent, teaching his students even outside the classroom setting. She also said he is humble and makes jokes about himself. A member of the Texas Atomic Iron Commission, Broderick continues to learn from other metal sculptors. The group traveled to Japan in 2015 for the US-Japan Art Exhibition at the Tokyo Museum of Art.